Liaison officers to the Korean Military Armistice Conference at Panmunjom, Korea, initial maps showing the northern and southern boundaries of the demarcation zone (Dec. 2, 1951). Amid talk of a peace treaty, a look back at the arduous negotiation process behind the Korean Armistice Agreement. In the simple hut village of Panmunjom in the 1950s, North Korea and China proved that they were shrewd opponents on and off the battlefield. Through the Korean War, the United States gained critical insight on Western resolve as well as the political-military determination of their Cold War opponents. 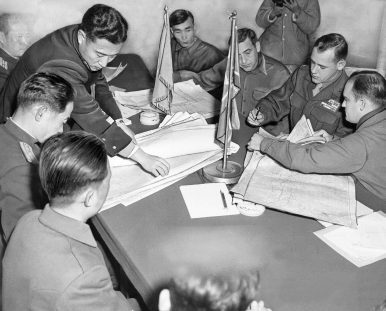 After the U.S.-led United Nations Command (UNC) drove the North Koreans north of the 38th parallel, the desperate communists saw an opportunity to utilize the ensuing armistice negotiations for both tactical and strategic maneuvering. After nearly 200 sessions and 400 hours of discussions in a span of two years and 17 days, the UNC would finally bring the Korean War to a de facto end with their values intact. For both sides, there was never a question whether a ceasefire should be signed, but the impasses and breakthroughs during the armistice process were underpinned by a strategic-level game of give-and-take at the expense of combat forces holding the line. This is a glimpse at those strategic currents and their indelible lessons. On June 23, 1951, the Soviet Union recommended that the Korean War combatants come together to discuss the conditions necessary for a ceasefire. U.S. President Harry Truman agreed with this sentiment, and weeks later, the commander of U.S. Naval Forces of the Far East, Vice Admiral C. Turner Joy, represented the United Nations (UN) along the 38th parallel in the former Korean capital of Kaesong. Lieutenant General Nam Il, the surprisingly young 37-year-old Chief of Staff of the North Korean Supreme Headquarters, led the North Korean delegation and represented Kim Il Sung. Major General Hsieh Fang led the Chinese delegation and represented the highly esteemed General Peng Dehuai – Communist China’s famed hero, who helped beat back the Japanese and the Nationalists just years prior. After a year of intense fighting, the international community believed that all the belligerents would be eager to sign an armistice. However, as the weeks progressed, the once optimistic Joy recognized that he entered into a vortex of “merry-go-round talkathons.” The communists fought the UNC on every detail, from room decor to lines on a map, and never shied from levying complaints about any perceived wartime violation by the UNC for propaganda purposes. In addition to hard bargaining, the communists utilized a variety of intimidation tactics to gain a psychological advantage over their UNC counterparts. North Korean guards often stared menacingly and brandished their weapons at UNC delegates as they arrived in Panmunjom. Nam once stared silently at Joy with a snarled face for an entire two-hour session. On several occasions, Nam’s delegation manipulated the chairs inside the negotiation tent to force Joy to sit in a seat shorter than his counterpart. And in another instance, Nam’s team placed larger North Korean table flags beside the smaller UNC table flags so that cameramen could photograph this disparity for the world to see. All games aside, the immediate issue that stalled armistice negotiations pertained to the location of a demilitarized zone and its associated ceasefire. When the talks first began, the line of contact was located several kilometers north of the 38th parallel. Joy argued that the center of a demilitarized zone “would be the line of contact between the belligerents at the time the armistice was signed.” Nam and the communists argued fervently for a demilitarized line on the 38th parallel in a wishful effort to reclaim lost terrain. Evidently, a common negotiating tactic is to make an impossible demand as a starting position only to negotiate it back when the opportunity presents itself. From the outset of the truce talks, the communists wanted to secure a ceasefire from the UNC prior to any armistice discussions moving forward. Joy understood this conditional trap. If the UNC agreed to a premature ceasefire, the communists would be incentivized to delay armistice negotiations as long as possible to negate UNC military pressure on the ground. Simultaneously, communist forces would gain precious time to regenerate their beleaguered combat forces at no cost. To overcome this roadblock, in November 1951, the UNC proposed using their current line of contact as the demarcation line, but only if the communists signed the armistice within 30 days. The communists, who were primarily seeking a combat reprieve, eagerly agreed to these terms in order to prevent further military gains by their opponents. From the UNC perspective, they believed their offer was sufficient in pressuring communists to rapidly negotiate an armistice. However, they were mistaken. As Joy suspected all along, the communists used the next 30 days to aggressively reinforce their defensive positions with obstacles, fresh troops, and supplies. The 30 day time limit came and went, and by spring of 1952, the UNC seriously questioned whether the “Reds” were even serious about ceasing hostilities. On the contrary, the communists were adamant about the unconditional return of all their men. Kim Il Sung and Mao Zedong did not want to give the world even the slightest indication that their countrymen wished to escape their utopian homelands. Furthermore, Kim and Mao feared that their likely inability to achieve reunification by way of total victory would severely undermine both their ideology and their ability to lead post-conflict. Thus, accepting voluntary repatriation would only further weaken their moral authorities. Despite China’s drastic losses on the battlefield, Mao believed that continuing the war would be politically useful for the newly formed Communist China. During a meeting with the Joseph Stalin in August of 1952, Chinese Premier Zhou Enlai said that fighting the United States to a draw increased their global prestige, aided in unification, and provided their army with invaluable combat experience – the exact experience needed to eliminate the Nationalist Party. However, China’s continued involvement with North Korea was conditioned upon gaining financial support from the Soviet Union to enact their nation’s First Five Year Plan based on a “Stalinist model.” Stalin ultimately supported China, as the Korean War served as an ideological bastion against the West and a useful entanglement that siphoned critical resources from the United States. Consequently for the UNC, after countless “talkathons” from June to October 1952, they unilaterally ended negotiations. By February 1953, fighting across Korea had devolved into sporadic skirmishes and indirect fire volleys. War weariness affected both sides, and armistice negotiations seemed to have been suspended indefinitely. On February 22, UNC Commander General Mark Clark, acting at the behest of the U.S. State Department, sent a letter directly to Kim Il Sung and Chinese General Peng. The letter stated that the UN wished to immediately repatriate only sick and wounded POWs as an act of goodwill. The communists did not respond for weeks; however, they quickly realized that this request gave them a critical opportunity to save face amid growing military pressure from the UNC and to manage their existential outcomes amidst three ominous developments. First, the newly elected U.S. President Dwight D. Eisenhower made it publicly known that he was willing to escalate the war in Korea and potentially all of Asia. In January 1953, after his inauguration, the United States successfully tested a nuclear weapon that could be readily adapted for use by tactical artillery pieces. Shortly after this test, Eisenhower approved the expansion of the South Korean Army from 14 to 20 divisions at a cost of about $1 billion dollars. This effort would add much-needed combat power on the battlefield in time for the spring-summer fighting season. Second, in February 1953, Eisenhower declared that he planned to remove the U.S. Navy’s Seventh Fleet from patrolling the waters between mainland China and Taiwan. Through this action, the United States would remove itself as a safeguard that prevented both the Chinese Communists from attacking Taiwan and the Chinese Nationalists from attacking the mainland. In his State of the Union Address, Eisenhower lamented that the United States was serving as “a defensive arm of Communist China” and that the U.S. should “have no obligation to protect a nation fighting us in Korea.” To add to Communist China’s ire, in late 1952, Chiang Kai-shek boasted about the improved fighting efficiency of the Nationalists and their readiness to seize the mainland. In turn, Mao realized he faced an ill-fated two-front war – the same precarious scenario Chiang faced as he fought both the Japanese and the communists in the 1930s. To the surprise of the UNC, on March 28, Zhou Enlai notified the UN that China and North Korea were ready to resume negotiations at Panmunjom. They also agreed to the U.S. desire for a neutral commission to manage POWs who did not wish to repatriate. Mao and General Peng concluded that their communist offensive had culminated months prior, and they also wanted to preserve invaluable propaganda victories; particularly the narrative that describes how a newly formed Communist China was able to beat back great Western powers – a historical first since the era of Western humiliation began in the 19th century. Moving at lightning speed now, on April 11, UNC and Communist negotiators met again at Panmunjom and agreed to exchange the sick and wounded POWs. During Operation Little Switch, lasting from April 20 to May 3, the UN returned 6,670 communist POWs (5,194 North Koreans, 1,030 Chinese, and 446 civilians) and the communists released 684 prisoners (471 South Koreans, 149 Americans, 32 British, 15 Turks, and several members each from Australia, Canada, Colombia, Greece, Netherlands, Philippines, and South Africa). The eventual success of Little Switch set in motion the diplomatic momentum needed to resume armistice discussions. By April 27, the primary representatives on each side resumed armistice negotiations on site at Panmunjom. To the surprise of UNC negotiators, the communists who fought tooth and nail on every detail now accepted the principle of voluntary repatriation with relatively few reservations. Ironically, it would be South Korean President Syngman Rhee that protested against these hasty armistice negotiations in the closing weeks and days. Rhee, like retired General Douglas MacArthur, believed that there was no “no substitute for victory” and that Korea had to be reunified by force. Ultimately, to appease Rhee and to guard the armistice, Eisenhower promised a mutual security pact, long-term economic aid, and the resources needed to expand the South Korean Army to 20 divisions. On July 27, 1953, five months after Clark’s good faith letter, the UNC and the communists signed the armistice at the simple hut village of Panmunjom. There were no handshakes or smiles inside the negotiating tent as the world rejoiced abroad. The chief delegates, Lieutenant General William Harrison of U.S. Eighth Army and General Nam, did not exchange a single word. Unsurprisingly, all sides claimed victory despite the war’s uncertain end. The United States demonstrated its moral resolve against evil and semi-validated the effectiveness of limited war and containment. Kim and Mao secured aid from the Soviet Union, and their nations both celebrated a victory against Western imperialism at significant human costs. Rhee, permanently bitter for falling short of reunification, found solace in securing a strategic ally and economic support for his war-torn nation. In a television broadcast shortly after the armistice signing, Eisenhower reminded the international community that “We may not relax our guard nor cease our quest,” as the world was still not at peace. These words ring true today. Adam Yang is a Marine Corps Officer and a Doctoral Fellow for the Commandant of the Marine Corps Strategist Program. He is an inbound Ph.D. student to the School of International Service at American University this Fall 2018. All views are his own.